Currently only Koha is implemented, but interactions with other ILSes could be added in the future. Vendors can be synchronized between Coral and Koha. Koha 18.05 or later is needed to use OAuth authentication. Earlier versions of Koha used cookie-based authentication to access the REST API, which is not suitable in our case. In Koha, install Net::OAuth2::AuthorizationServer and enable RESTOAuth2ClientCredentials system preference. 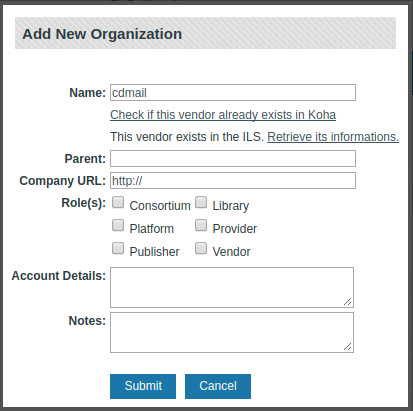 In Koha, create a user for the REST API, edit this user, click on more -> manage API Keys -> Generate new client id/secret pair. oauthid="<paste Client ID generated in Koha>"
oauthsecret="<paste Secret generated in Koha>"
ilsConnector is the name of the ILS you want to connect to. 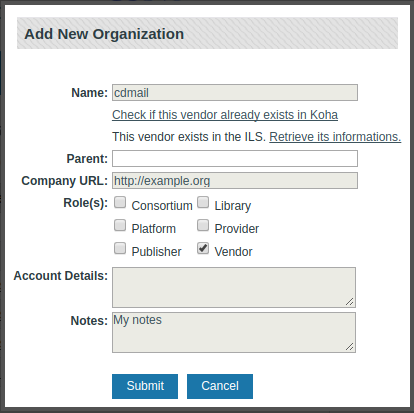 ilsVendorRole is the Coral organization role you want to map with Koha vendors. ilsApiUrl is Koha’s API address. ilsAdminUrl is Koha’s intranet address. oauthid is the client ID generated in Koha. oauthsecret is the secret generated in Koha. 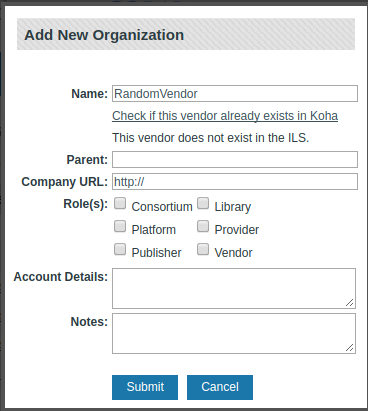 If the vendor does not already exist in Koha, it will be added if the vendor role has been selected. In both cases, the vendor can no longer be modified in Coral, as the ILS is authoritative.